Each Friday, we share three topical longreads in our Weekend Reader newsletter. 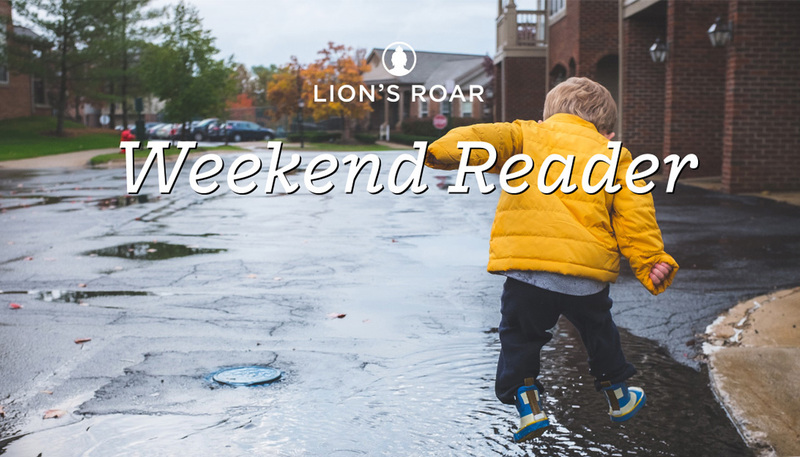 This week, Lion’s Roar magazine’s Andrea Miller appreciates the beginner’s mind of a child. Sign up here to receive the Weekend Reader in your inbox. One day, it was raining hard as we made our way there. Though Alexandra stayed dry under the canopy of her stroller, I got soaked, so before “Baby’s First Books” got started, I went to the bathroom to change. Alexandra blinked her shiny brown eyes. As always, I was just babbling so that Alexandra would have exposure to the rhythm of language, but there in the bathroom the meaning of what I was saying suddenly hit me. What would a new-to-the-world person make of rain? Water had fallen from the sky and landed, not just in my hair, but also on pine trees and poppies and carrots. It had replenished rivers, lakes, and seas. Rain is ordinary, the product of a scientific process, but it is also a life-giving miracle. For a moment, I was overcome by the perfect beauty of this glistening wet world and I just stood there, with my hands resting on the dripping handlebars of the stroller. But, as I stood soaking wet in the library, I was only thinking of my daughter who, it has turned out, is also my teacher. While I was trying to teach her, her presence alone was teaching me. And it still does. For me, watching a child encounter and puzzle over her world for the very first time is the most powerful way of tapping into beginner’s mind. These days, at age three, Alexandra’s teachings are getting deeper and deeper. She talks now, and sometimes in her endless questions I think I hear a koan. Here are three articles from other parents who, like me, are learning right along with their kids. When we think of the Man of Steel, all sorts of powers come to mind: flight, heat vision, near-complete invulnerability. But we often overlook his greatest power: selflessness. Koun Franz on why he and his son aspire to be superheroes. Boy, as I sometimes call him, has taken to dressing as Superman. He has a Superman T-shirt and Superman underpants. The combination is known in our family as “going full Superman.” When he goes full Superman, he feels a little stronger, a little more grown up. I love this, and I take every opportunity to remind him that Superman’s job is not fighting bad guys; it’s protecting everyone else. “Protect” is a word we use a lot at home. He likes to protect his little sister. He likes to protect his friends. Being Superman, he gets to play that it’s his job. And then, if he’s tired of it, he can take it all off and just be a crazy boy. Karen Maezen Miller was torn when her daughter entered the Barbie stage. But what was worse — the doll’s commercialism and hyper-sexuality, or Mom’s grownup judgments and concepts? How troubling when our daughters reach so readily for those eleven inches of molded plastic; the slender body that fits so easily in their still-dimpled hands; the far-from-lifelike doll that survives every kind of fashion torture, burial in sandboxes, drowning in bathtubs, and disastrous haircuts administered in secret with forbidden scissors. How mortifying when, among all the more sensible offerings, all the appropriate and sanctioned playthings, our daughters more or less universally agree: Barbie is good. It’s in that rub, the eternal struggle of bad versus good, right versus wrong, that I see the hidden dimension of the icon under the bed. It goes beyond the unassailable ideals of gender neutrality and healthy body image. It’s far subtler than choosing sides with demons or innocents. It’s not us versus them; it’s neither black nor white. It’s dharma, the dharma of Barbie, available for as little as $5.99 at the discount superstore. When author Karen Connelly loses her cool in a battle of wills with her three-year-old, she learns valuable lessons about mindful parenting. All our lives, we learn about being human by watching what other people do, but during childhood, it is our first and deepest form of education. Children want to do what their caregivers do; they want to be like us. Very little escapes their sensibilities. Our actions pass through them like electrical impulses, subtly or overtly influencing their behavior, flavoring their essence. In everyday conflicts with my child, I know that slowing down will add lightness to the air, a moment of breath for both of us. This black-haired boy resembles me in so many ways; he has the same quick temper, the same readiness to laugh. When I remember to play more, even through my anger, he responds in kind. But I often forget to play. I tighten up, clamp down. I want my will to be done, like the old Christian God, I, too, want to be a master of the universe, and of my child. But I am not. And he knows it.